The Port Authority of New York & New Jersey (PANYNJ) is exploring the beneficial reuse of dredged materials as part of its strategy to develop former port areas in the region in ways that are not only environmentally sustainable but also proactive about climate change. This pilot project is applying existing dredge expertise to new challenges in port areas, such as sea level rise. Nautilus is acting as a consultant to the PANYNJ, helping to coordinate their interdepartmental team, overseeing a multi-disciplinary team of technical subconsultants, and assisting with obtaining input from public agencies and local organizations. 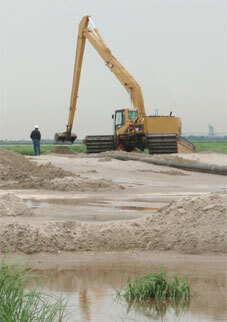 During Phase 1 of the pilot, the technical team produced a written report including a description, comparison and analysis of state-of-the-art technologies for the use of clean dredged materials; an evaluation of a range of possible climate change applications in SW Brooklyn; and a proposal for a site-specific demonstration project on SW Brooklyn&pos;s waterfront. Download Nautilus&apos; Executive Summary of Phase 1 here. During the second phase, the demonstration project is being developed further in collaboration with the property owner, advisory group and community, and possibilities are being explored for its funding and implementation in coordination with Hurricane Sandy rebuilding efforts by New York City and State. Wetland restoration with dredged materials.